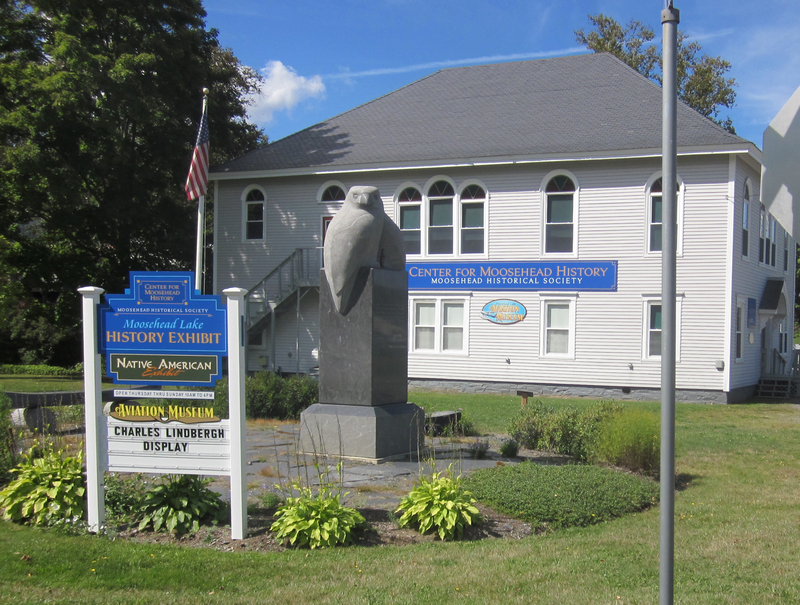 Located at 6 Lakeview Street, East Cove, downtown Greenville, is The Center for Moosehead History, also home to The Moosehead Lake Aviation Museum. Constructed and dedicated as the Universalist Church in 1904, and known locally as The Community House, this historic building was acquired by the Moosehead Historical Society in 2005. It now serves as the home of The Center for Moosehead History and the Moosehead Lake Aviation Museum. 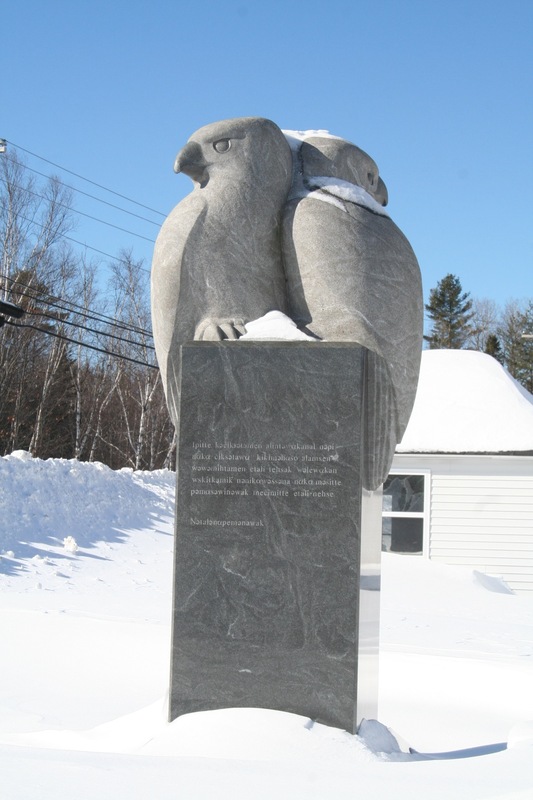 In 2007, Maine Woods Forever celebrated the creation of the Thoreau Wabanaki Trail by unveiling two granite sculptures on the lawn of the Center for Moosehead History. The sculptures are mounted in honor of Henry David Thoreau and his Penobscot guides, Chief Joseph Attean and Joseph Polis. This date of the unveiling marked the 150th anniversary of Thoreau’s third and final trip into the North Maine Woods. Two of his trips began their water route from Greenville’s East Cove. The larger sculpture, which was created by Jim Sardonis is topped by two hawks and carries a Thoreau quotation: “I went to the woods because I wished to live deliberately, to find only the essential facts of life, and see if I could not learn what it had to teach, and not, when I came to die, discover that I had not lived,” and a second quotation from the Penobscot Nation in their tongue: “If we listen to the songs of the water and the whispers of the wind, we will feel the heartbeat of Mother Earth, and all creation will continue to breathe.” Penobscot Tim Shay created the canoe-like bench as a companion and resting piece. In 2010 Maine Woods Forever transferred the sculptures’ ownership to the Moosehead Historical Society. The pieces have been well received as a means of honoring the Native American presence in the Moosehead region and Thoreau’s journeys with them that famously logged his experiences into the wilds for all to understand. Exhibits focus upon Moosehead’s Native American influence, families, and an extensive array of tools; the logging industry; Town of Greenville cultural heritage; and a special interactive exhibit depicting life in the area during the 1800s. The large exhibit hall on the main floor also includes an annually changing exhibit of local interest; a gift shop offering books and videos pertaining to regional history, and the opportunity to view selected historic films. The large second floor auditorium offers an acoustical sound space for both Museum-sponsored events and other programs. It is also available to the public for rent at a very reasonable rate.